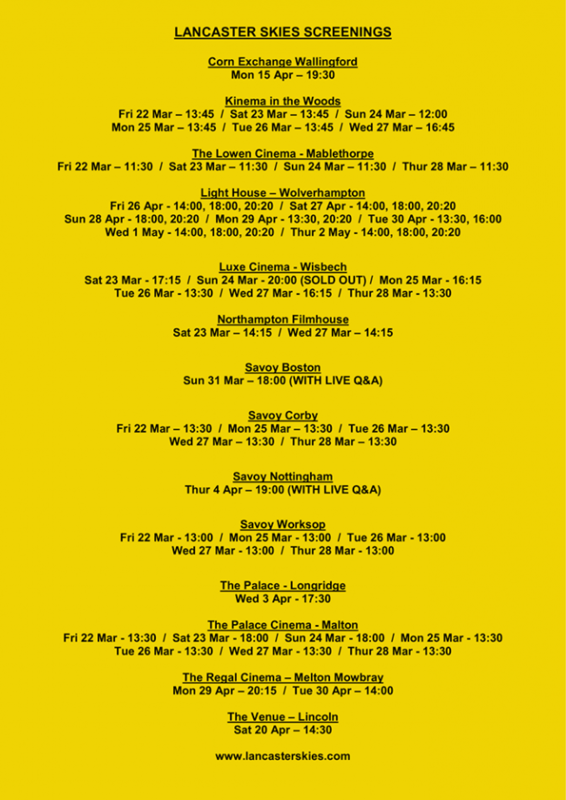 In the true style of #IndependentFilm Andrew Burn and his son Callum have toiled long and hard to bring their film Lancaster Skies to the cinemas (see showings list below and our interview with the brothers). 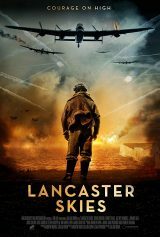 Lancaster Skies is a World War II tale that is strongly character driven, with high production values, which set this film at a stratospheric height. As we see war weary veterans struggle with their daemons to keep the fight up against Nazi Germany. Events are set in the Spring of 1944 as a returning Lancaster makes it’s way back from a bombing run. It is dark and murky and everybody is on tenterhooks as they make their way back to Blighty, but out of the murk comes a German night fighter. It strafes the squadron and our flight crew Alfie Hammond (Tom Gordon, The Wind Cries (Short)), George Williams (David Dobson, The Drift), Thomas Mayfield (Vin Hawke, Retribution), Henry Smith (Josh Collins, Loulou) and tail gunner Charlie Moore (Kris Saddler, Await Further Instructions) frantically try to shoot down the fighter but the bomber is hit. Alfie is hit but says nothing and carries on getting the plane down safely. But he doesn’t survive his injury. They need a new flight Lieutenant and that is where ex-fighter pilot Douglas Miller (Jeffrey Mundell, Survivors) comes in. A man of strict moral standing and his own fair share of dark shadows in the wardrobe, his young brother Ron (Eric Flynn). Douglas meets Sgt George Williams who is a lot more live and let live than Douglas, who wants everybody to follow procedure like at Fighter Command, which puts him at odds with the rest of his crew, especially with Charlie Moore who has a massive chip on his shoulder after the death of Alfie. Eager to get in on the fight, it is frustrating that his sorties keep getting cancelled for one reason or another so he is forced to interact with his crews social life down the pub where he meets the ladies who look after all the paper work along with AC Daniels (Robert Francis, The Drift), Jo (Rosa Coduri, Brotherhood) a fan of George and then there is Kate Hodges (Joanne Gale, The New Boy) a fan of Laurel and Hardy. Hope you are both well, welcome to RoadRash Review Six Shooter interview, here are your questions. 1: Can you tell us a little bit about yourselves and what inspired you to make Lancaster Skies? Callum (27) has been making structured films since he was just six years of age, running around with a video camera with his friends and cousins. He graduated from Met Film School in 2013 with a first class degree in Practical Film Making. Andrew (53) has had a life long passion for film and the film making process. He began writing scripts in the early 2000’s. At same time started helping Callum produce his student films. Worked on his first feature (zero budget sci fi) as a set builder/prop maker in 2011. We hit upon the idea for Lancaster Skies while shooting their short war film ‘Fuslier’ in 2012. During a break in filming a RAF Hercules flew very low over the location – inspired to make RAF film from then on. 2: How long has the process been from first concept to your first screening and how did that go? Lancaster Skies took five years to produce. The first draft of the script (then entitled ‘Our Shining Sword) was completed in late 2013. The tiny budget and sporadic funding meant that the film was shot in 5 shooting blocks between Feb 2015 and April 2017. Post production too a further year. The first screening was to cast, crew and crowdfunders in May 2018. At that time the film was graded in Black & White (The B & W version will be a Blu-Ray extra). Obviously it was very exciting to see the film on the big screen for the first time. The audience reaction was very encouraging too, although the film has yet to be tested in front of a non partisan audience. 3: How long and difficult was it to build your sets of the cockpit etc.? The set builds were very challenging. First we had to stretch ourselves financially to rent a suitable space. 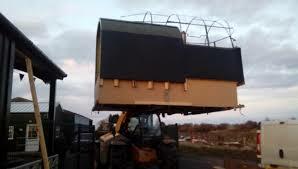 All of the sets ended up being built in a converted cow shed, which was large, but less than ideal – freezing in winter, boiling in summer with no sound insulation. With no money for materials we asked a local builders merchants for help – they stepped up and donated 4 lorry loads of timber. 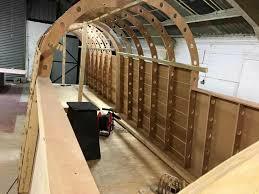 The first set build (RAF base offices and corridors and pub) took a couple of months, with Callum and Andrew working full time and a handful of volunteers helping out when they could. The Lancaster build began in the winter of 2015/2016 – initially constructing the smaller pieces such as the machine guns and tail gun. The main body of the Lanc was built over 8 weeks using a set of model aircraft plans and a Haynes manual. The final 4 weeks, before filming in April, was spent making and installing all of the internal components – cockpit controls, radio and navigation equipment etc. During this period we worked long hours seven days a week to get the Lanc finished in time. 4: Where did you manage to find all the period props and locations and how long did it take to get the permission to use your locations? Some of the period props and consumes were purchased, some we made or built from scratch and some were borrowed. 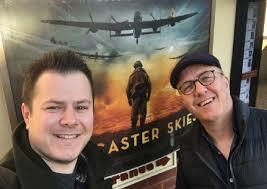 For example, Andrew was in charge of costume, as well as set building, and made all but one of the flying helmets and all of the parachute harnesses featured in the film. Locations weren’t too difficult to find, although securing permission to film at some was quite challenging. E.g. building trust and securing permission to film at the Lincolnshire Aviation Heritage Centre at East Kirby with their Lancaster ‘Just Jane’ took almost 2 years. 5: What was the biggest headache during the filming and what was the best part, also what did you both get out of it? The biggest headache was never having enough money. A simple thing like buying a tin of paint could sometimes be incredibly challenging. The worst part was constantly worrying about where we would find the money to pay the cast and crew. At the time it was hard to say what we were getting out of it. We just knew that we had committed to making the film and kept moving forward. Obviously things feel different now. Securing distribution with Kaleidoscope felt akin to winning the lottery and the reaction from cinema audiences has been incredibly positive. We feel incredibly proud and very fortunate to have got to this point. 6: What has the future in store for the Burns? The future is looking very promising indeed. We have several film ideas in the pipeline, including another war film about two Spitfire Pilots who are shot down over Dunkirk in 1940. Other film ideas include a sci-fi set in the 1950s and comedy drama about a London gangster on the run in modern day rural Lincolnshire. Thank you Andy and Callum for taking the time to talk to us, all the best for the future RRR.